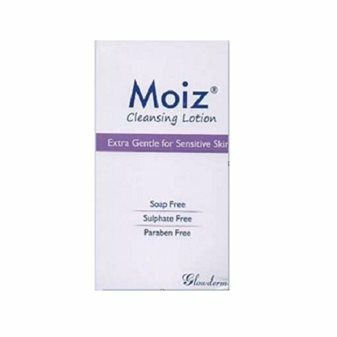 Moiz Cleansing Lotion is a soap-free daily cleanser for thorough cleansing of sensitive and dry skin. This therapeutic skin cleanser is recommended for cleansing damaged skin and removing dirt/make-up. The Moiz cleanser leaves skin supple, smooth, and dirt-free from the first application. With balanced pH level between 6.3-6.5 approximately, the skin cleanser is fragrance-free and non-comedogenic. The non-drying, hypoallergenic, and non-irritating Moiz cleanser is effective in retaining skin’s natural level of moisture. The skin cleanser is free of sulphate and parabens for gentle cleansing.